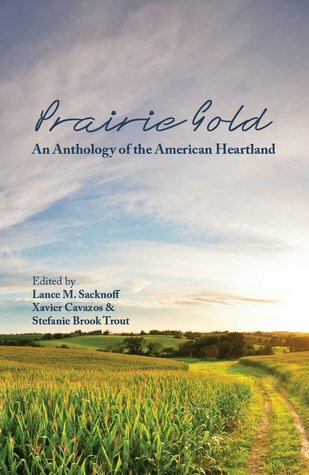 I am pleased to announce three exciting pieces of Prairie Gold news: an upcoming radio interview, our Midwestern book tour, and a Goodreads Giveaway. Today, editors Lance M. Sacknoff and Stefanie Brook Trout will discuss Prairie Gold on KRUU 100.1 FM, the Voice of Fairfield. Stefanie will read an excerpt from her essay “Letters After Achilles.” Listen live from 1:00-2:00 pm to catch the Writers’ Voices talk radio show. Featuring poetry by Lindsay Tigue, Sandra Marchetti, Nancy Cook, Stephanie Schultz, and Michelle Menting; fiction by Matthew Fogarty and Molly Rideout; and nonfiction by John Linstrom and Sarah Elizabeth Turner. In addition to the off-site reading, we will also have a table at AWP, so come see us at Booth #119! We expect to add one more Iowa reading in Des Moines and a few more outside of Iowa, so follow Prairie Gold on Facebook to make sure you don’t miss any additional developments. Prairie Gold is on Goodreads, which means you can now add it to your shelf. Have you already read it? Please take a minute to rate and review the book. Don’t have a copy yet? Enter our Goodreads Giveaway contest by October 31, and you could win one of five copies!